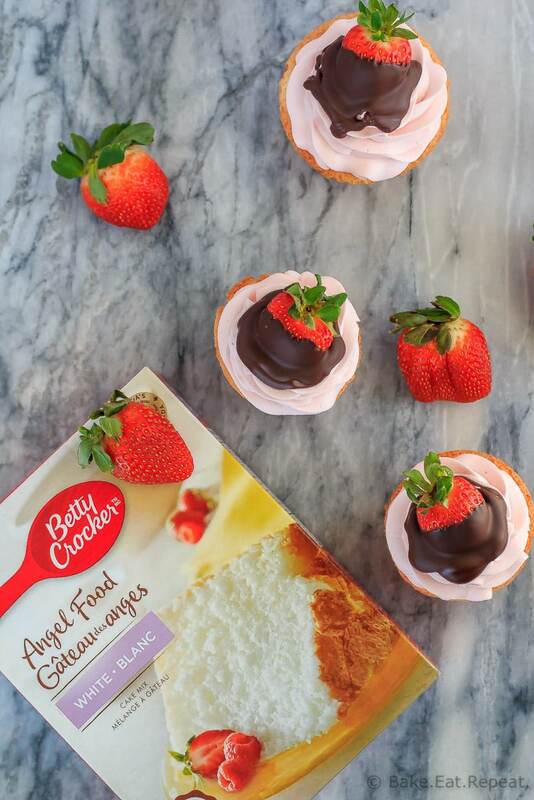 These chocolate covered strawberry cupcakes are the perfect sweet treat for Valentine’s Day – angel food cupcakes with strawberry whipped cream frosting, and a chocolate covered strawberry on top! Disclaimer: This post has been sponsored by Life Made Delicious as part of their #CookUpIncredible campaign and I have been compensated for my time. All opinions are, as always, my own. I don’t know if I’ve every actually done a specific Valentine’s Day dessert recipe post on here. There’s plenty of chocolate (more then necessary, I’m sure) but nothing that screams Valentine’s Day. These chocolate covered strawberry cupcakes make up for that. They scream Valentine’s Day all the way. Chocolate covered strawberries tend to do that. Although I would happily enjoy one of these cupcakes any day of the year. My sister has already informed me that I need to make them again for her birthday. Her favourite dessert of all time is angel food cake with whipped cream and strawberries so it’s not really a surprise that she loved these. But really, who doesn’t enjoy angel food cake with whipped cream? And when it’s strawberry whipped cream topped with a chocolate covered strawberry? Even better. These cupcakes are so pretty, but actually not hard to make at all. The cupcake is actually made from a cake mix, which I know I don’t usually have in my recipes, but angel food cake is the one cake that I just don’t make from scratch. I’ve done it once before, and I’m sorry, but it’s just not worth it. It takes quite a while to make from scratch, it uses a dozen egg whites, and doesn’t taste any different. Cake mix all the way for this one – it tastes great and is much easier. The strawberry whipped cream is super simple to whip up, it’s flavoured with strawberry jam and stabilized with gelatin so it lasts when you pipe it on the cupcakes. It’s so tasty, you won’t mind if you have some left over after frosting the cupcakes! And chocolate covered strawberries. Just to take these cute little cupcakes over the top. 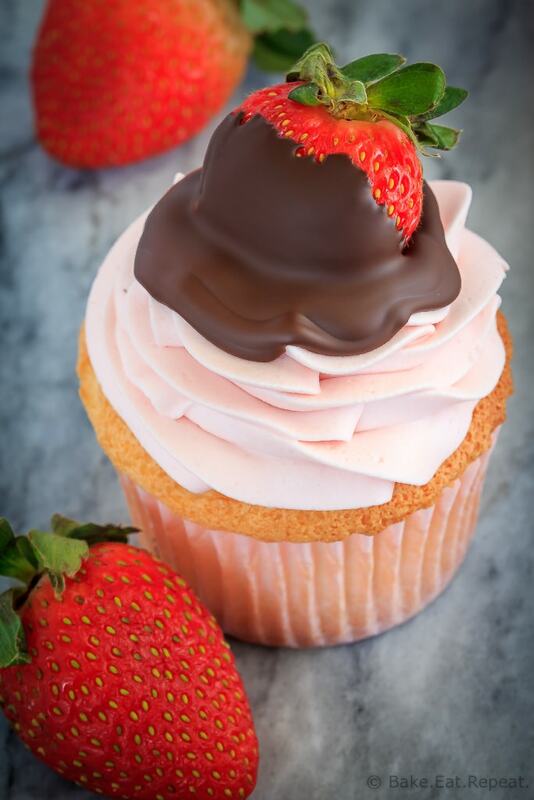 Because everything is better with a chocolate covered strawberry on top! 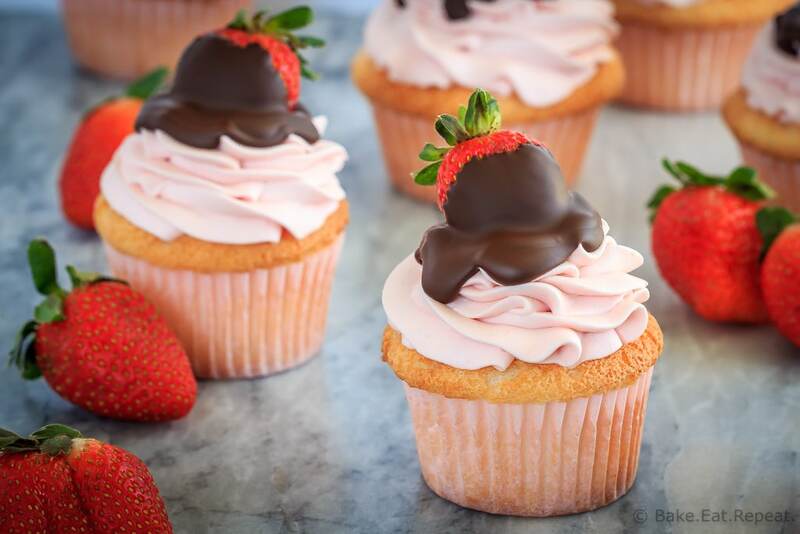 If you’re looking to make someone’s life delicious this Valentine’s Day, try these cute little chocolate covered strawberry cupcakes – you won’t be disappointed! 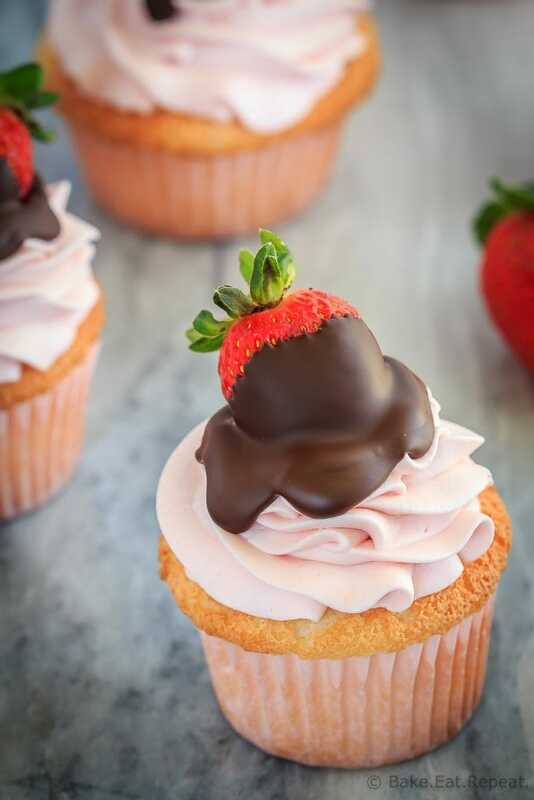 These chocolate covered strawberry cupcakes are the perfect sweet treat for Valentine's Day - angel food cupcakes with strawberry whipped cream frosting! Preheat the oven to 375 degrees F. Line muffin tins with paper cupcake liners and set aside. Prepare the cake mix batter according to the package directions and spoon the batter into the prepared muffin tins, filling the cupcake liners 2/3 full with batter. Bake the cupcakes for 11-12 minutes, or until the tops are cracked and dry to the touch. Let them cool completely. In a small bowl, stir the gelatin into 4 tablespoons of cold water and let it stand for 5 minutes, or until it is thickened. Heat it carefully in the microwave for about 30 seconds to melt the gelatin. With a stand mixer or an electric mixer, beat the whipping cream with the powdered sugar and strawberry jam for about a minute. Slowly pour in the gelatin while the mixer is running. Continue beating the cream until stiff peaks form, adding a few drops of food colouring at the end of the beating time if desired. Put the strawberry whipped cream into a piping bag with a 1M tip for piping onto the cupcakes, and pipe it in a swirl, starting from the outside of the cupcake and moving into the middle. In a medium bowl, melt the chopped chocolate in the microwave at 50% power, for 3-4 minutes, stirring every 30 seconds until the chocolate is just about fully melted. Continue stirring until it is completely melted. 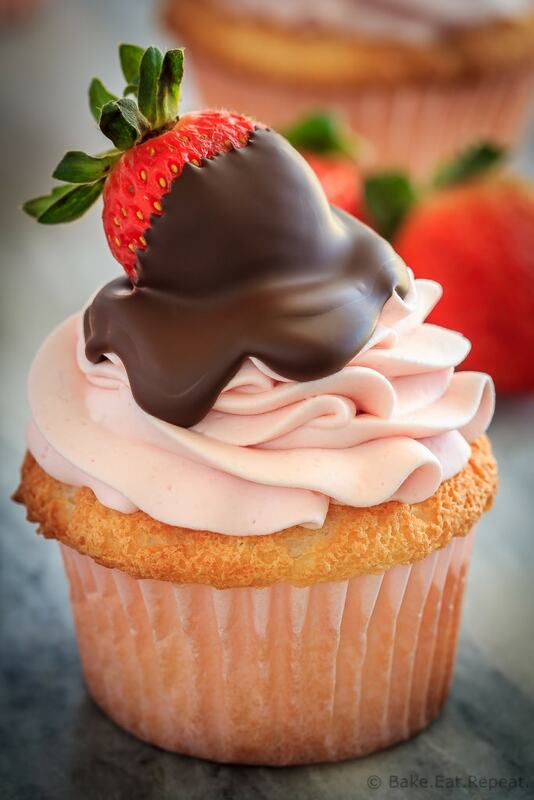 Spoon about a teaspoon of melted chocolate onto the top of a decorated cupcake, then dip a chilled strawberry into the chocolate, letting the excess chocolate drip off, and press the dipped strawberry onto the top of the cupcake. Repeat for the rest of the strawberries. The decorated cupcakes will keep for 2-3 days in the refrigerator in a sealed container. You may have some leftover strawberry whipped cream, depending on how big a swirl you put on each cupcake - it keeps well in a sealed container in the refrigerator for 3-4 days. Also, 8 ounces of chocolate was enough for me to dip all 30 strawberries, but they were on the small side, so depending on the size of your strawberries, you may need a bit more chocolate to dip them all. I do recommend using chopped baking chocolate rather then chocolate chips for dipping as it does melt nicer. These look amazing Stacey! Am I missing something? I don't see any buttons to save or share. No, they were slowing down my site so I removed them, and haven't picked a new plugin to do it yet! You can just share the link on any social media site though - or pin with the browser extension if you want to!